"Citizen Science" is scientific research and data gathering that is conducted or assisted with public participation, often by amateurs and nonprofessionals. Such public interest and wishing to contribute to science is a growing trend, providing many chances to tap into volunteers and collect data. All these extra eyes and ears (and photos) the public can provide can greatly expand how much certain forms of data can be collected. This is what citizen science is all about, with regular people providing useful data, but it also can provide great opportunities for interpretation and public events. The free iNaturalist app is now more-or-less the standard way for bioblitzes and other citizen science projects to record natural history observations. The beauty of the app is that with a simple uploaded photo, crowd sourcing can then help identify the organism and the observation is recorded so that worldwide any researchers can data mine the info they need. You never know what piece of data you could be providing some researcher somewhere in the world. Here’s a link to various tutorials on how to use the free app: https://www.inaturalist.org/pages/video+tutorials . 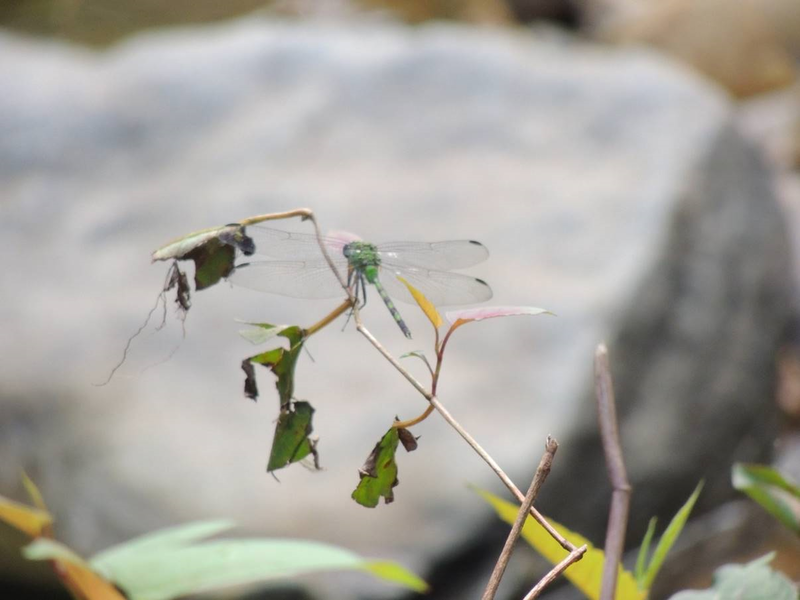 This Great Pondhawk Dragonfly was photographed by Arlington Regional Master Naturalist volunteer David Howell during the Arlington, Virginia 2018 Bioblitz. It was identified later by several people and led to quite a bit of discussion in dragonfly circles. as it turns out it was a state record and has never been seen this far North in the East before. 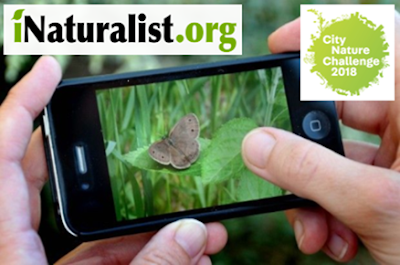 Bioblitzes and similar citizen science events such as the City Nature Challenge offer a lot of interpretive opportunities. To begin with, different teams and their leaders can serve as natural history walks and short programs. Indeed, by getting well-known experts and naturalists to lead groups, you can attract a nice group of interested people, some of which you may discover have great skill or knowledge in certain areas and thus might be recruited as potential long term volunteers. The central meeting location which many bioblitzes use can also be places for environmental groups to man booths, activity tables, conduct short presentations, games, and distribute information. Some activities can be geared for younger audiences and the novice or general audience who may just want to see some potential program or show. But the area can also serve to show people unique activities or to have unusual specimens brought back for ID and to show others. Indeed, having people bring back invertebrates for an expert to ID can prove to provide neat discoveries for the public to make. If you stagger teams and activities, people may show up interested in one thing, but be introduced into others they may not have thought they were interested in but are willing to try out. Many people my want to take advantage of an opportunity to be part of expert teams and learn from them in the field. Take for example this short look at a fungi ID team during a bioblitz and the process they used which fascinated many people who had no idea about this wonderful group of organisms: https://www.youtube.com/watch?v=rLrn51pBzus. Many expressed interest in learning more about these organisms and were fascinated by the myriad of fungi they were introduced to in their local parks. In preparation for some the bioblitzes I’ve organized and some of the biotic inventory events I’ve been lucky enough to participate in, we made several preparations that were also good permanent or temporary habitat improvements. This included not only placing of strategic habitat logs and creating stream caves for wildlife, but we also often place "snake boards ". The boards form artificial cover (and can house much more than just snakes!) and are setup in areas we then continue to use to record findings and as part of nature observation programs and walks. We’ve also used bee cup traps, a Malaise flying insect trap, live box traps, nets, seines, black lights, and different baits in the past as well, depending on what taxa we were surveying. Each offered their own program and interpretive opportunities. Artificial cover, such as these "snake boards" can be placed in advance of a bioblitz or as part of any biotic inventory, and can be left permanently or moved about as places to check during walks or providing additional habitat features. The power of people making these “discoveries” themselves cannot be overestimated. Good interpreters understand the importance of the “wow” or “teachable moment” when something comes up and makes an important impression with the individual(s) who found it. Well, when people are out with a leader or on their own and make these discoveries themselves, it can make a real impact and offer a unique interpretive moment. Every outing can have the potential for such impactful “finds”. These discovery moments also help people become aware of what lives in their parks, which hopefully leads to appreciation, wanting to understand more, and wanting to take care of the places where they’ve made these discoveries, what some will note are the social continuum steps towards stewardship. That people make these discoveries themselves and in their neighborhood parks makes the stewardship experience even more powerful. An electro fish shocking team of colleagues from Fairfax were of great interest to people during the 2017 Arlington Bioblitz. These type of biotic survey events can also offer great networking and public relations possibilities. Staff from neighboring jurisdictions and environmental groups have often assisted and provided their expertise for events. I myself have also assisted many other jurisdictions and groups in their bioblitzes, City Nature Challenge, or other events. This allows for good networking opportunities, sharing of knowledge, good will, and unofficially "talking shop." Media often take great interest in these of public events, as shown in the Voice of American video linked above and much coverage of ongoing citizen science events. So citizen science special events have great potential as interpretive and media events. They are rewarding to participants while providing potential data for researchers. The next big opportunity, and it is repeated yearly, is the global City Nature Challenge April 26-29, 2019. So mark your calendars and give it a shot, either personally, as part of one of the many planned events, or perhaps to run an event yourself. 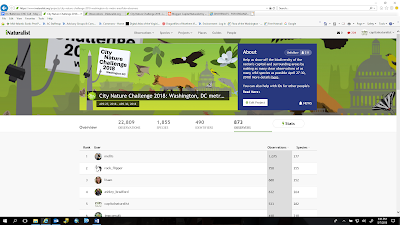 More information can be found here: http://citynaturechallenge.org/ though there are many cities with their own individual websites as (here’s the Washington, DC one I’m taking part in again for example: https://citynaturechallengedc.org/) Your own interpretive moments may help to provide valuable data to researchers while helping you and the public discover the wonders of the natural world all around their parks.